The word “chemical” scares people off – we’re so used to hearing the worst things about chemicals that many of us don’t think about the benefits. The facials that we provide use a mild acid to gently remove the damaged layers of your skin, leaving behind beautifully smooth and glowing skin. During the consultation with your esthetician, she will go over the type of facial she recommends for you (or if you have one in mind, she will explain what it all entails). Each facial has its different perks; some boost collagen to encourage a youthful and radiant glow, and others focus on removing dead skin to reveal the beautiful new skin underneath. Peels can be completed from anywhere between 30 minutes to one hour – the length of time is determined by the type of massage. For most, the healing process after a peel usually takes about one-two weeks. 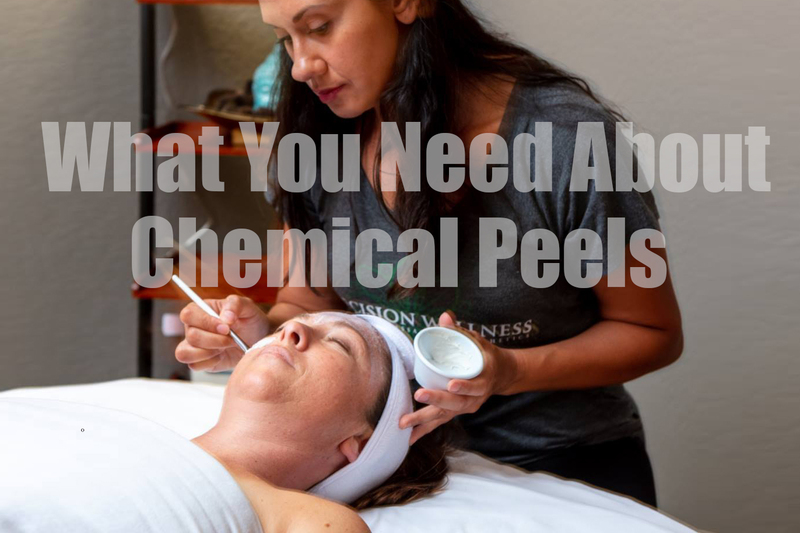 Because of this, we recommend getting a chemical peel no more than once every few weeks. While getting a facial peel is great for you, you want to give your skin enough time to build up another protective layer before getting another one. Depending on the peel, clients can expect some minor flaking, irritation, and redness at least the first few days. This is your body’s way of promoting new, healthy skin growth in place of the dead cells that were removed during the chemical peel. It’s important to remember that chemical peels are safe when performed by a professional. Once you see your new, cleansed, toned, refreshed skin, there will be no going back! (This is where people get hooked!) Our licensed estheticians, Serenia and Chloe, have extensive experience with chemical peels and would love to see how they can make your skin bright and youthful again!